Beautifully engraved Certificate from the Ask Jeeves Inc issued in 2001. This historic document was printed by the Thomas De Larue Company and has an ornate border around it with a vignette of Jeeves. This item has the printed signatures of the company's officers. By understanding questions in plain English and by providing fast access to relevant answers, Ask Jeeves has become one of the Web's most popular sites. 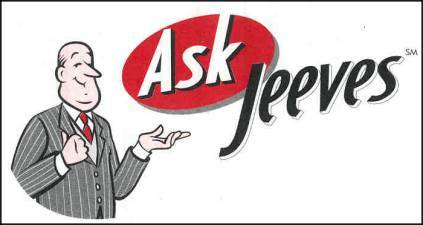 Ask Jeeves' properties include Ask.com, Ask Jeeves for Kids, DirectHit and Jeeves' Tours. 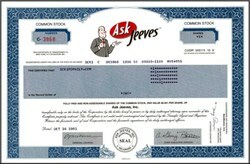 Ask Jeeves current advertising products include AnswerLink, Jeeves Shopping Guide, and Jeeves Advertising Services.Additionally, for businesses seeking to capture, convert and retain customers online, Jeeves Solutions offers industry-leading technology and unparalleled knowledge about customers' questions, needs and interests. More than 50 corporate customers including DaimlerChrysler, Dell, Ford Motor Company, Network Appliance, Nextel and Radio Shack use Jeeves Solutions.With its broad distribution platform, Ask Jeeves, Inc. provides an intuitive, intelligent way to connect users and customers to relevant answers, products, services and information in real-time. Ask Jeeves was founded in 1996 in Berkeley, CA, by David Warthen, veteran software developer, and Garrett Gruener, venture capitalist at Alta Partners and founder of Virtual Microsystems.